We are offering local students ages 12-18 the MARINE LIFE, ENVIRONMENTAL STUDIES, and SPANISH LANGUAGE & CULTURE PROGRAMS for day students. 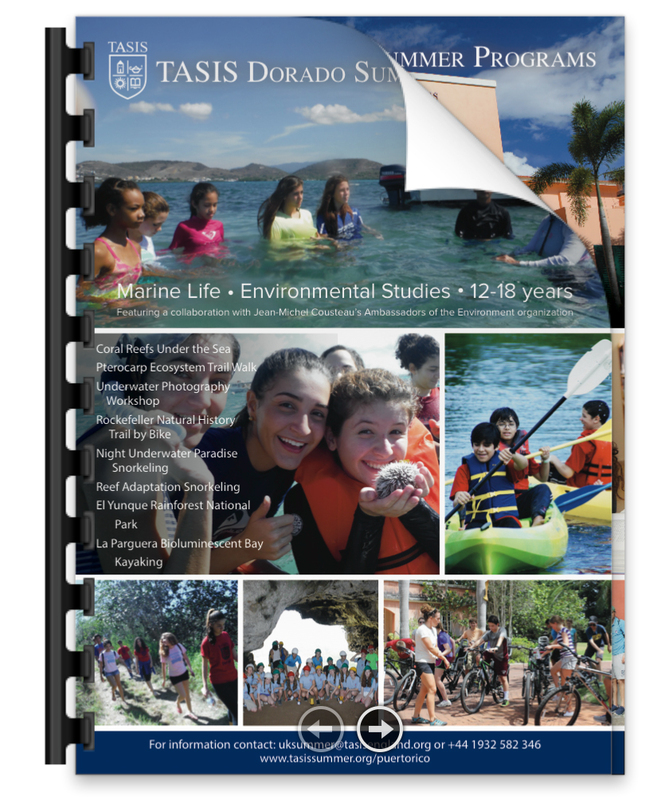 The programs make full use of the TASIS Dorado campus along with the highly desirable community of Dorado Beach and the nearby Dorado Beach Club, home to Jean-Michel Cousteau’s Ambassadors of the Environment organization. Spanish I, II, III, IV & V, Lengua en Vida (for all levels), Ambassadors of the Environment, Afternoon Sports Program, Water sports facilities at Dorado Beach Resort and Excursions & Activities. 10% discount for TASIS students and Sabanera Dorado residents. There may be some day when students will return to campus later than 6:00 PM. This information will be provided by the Director on a daily basis. Detail of Weekend Excursions will be advised by the Director. Drawing on the wealth of natural resources of Puerto Rico and the collaboration with the world renowned Jean-Michael Cousteau’s Ambassadors of the Environment, located at nearby Dorado Beach, TASIS Dorado offers an innovative Marine Biology/Environmental Science program for students ages 12-18. Puerto Rico is home to some of the most fragile and diverse ecosystems on earth, including three of the world’s seven bioluminescent bays, El Yunque, the only tropical rain forest managed by the US National Park Services, and the extensive coral reefs and rich marine life in the Atlantic and the Caribbean sea. Building on the success of the TASIS Dorado Summer Spanish Program and the increasing interest for environmental studies, the course focuses on the sustainability of these natural environments and introduces students to the critical ecological issues and the need to preserve and protect our natural world. Through extensive research in the science lab and on field trips, students gain an appreciation for the interdependence of organisms and the critical balance required to preserve their habitats. A highlight of the program is the opportunity to work closely with experienced local marine biologists and naturalists who are passionate about protecting these complex ecosystems and underwater world. The sustainability of these precious endangered environments are critical to the health of our planet and through hands-on experiential learning such as the restoration of coral reefs, students become knowledgeable environmentalists who can make a difference in addressing the challenges that face our natural world. 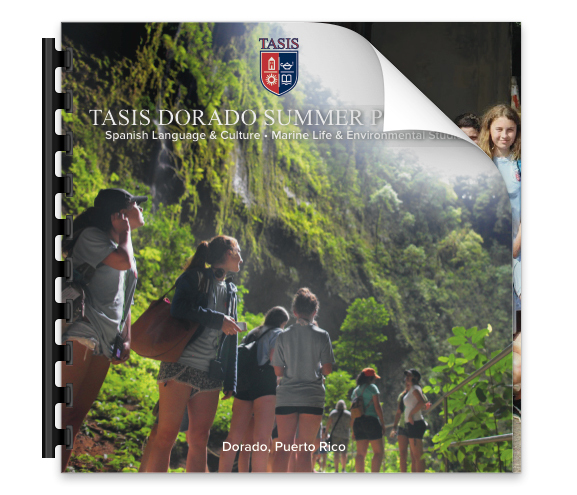 Teachers in the TASIS Spanish Summer Program are experienced, professional educators with a passion for working with students. They are carefully selected for their teaching qualifications, their experience working in American and international schools, as well as for their enthusiasm and energy for interacting with young people in all aspects of the programs, both academic and extracurricular. While providing challenging academic standards for students, members of faculty also serve as dormitory residents, activity leaders, and chaperones. The success of the Program rests largely on the professionalism of our teachers and counselors and the caring community they create. The Program attracts students aged 13-18 who are motivated and adventuresome. Their wide range of nationalities creates a dynamic international community and exposes students to a variety of cultures and languages. However, the Program remains small by design to encourage a friendly atmosphere in which each student can contribute and stand out as an individual. A 1:6 staff-student ratio and an average class size of 10 students allow for personalized instruction and individual attention. The positive interaction between students and staff greatly enriches the academic experience and makes for a meaningful and enjoyable summer. The wide range of excursions and activities complement the rigorous academic program and provide recreational opportunities to discover the cultural heritage and natural beauty of Puerto Rico while expanding the students’ Spanish language skills. Weekend trips include such destinations as beautiful Old San Juan with its historic El Morro Castle, El Yunque Tropical Rainforest with its incomparable collection of fawn and flora, the world’s largest telescope at the Observatory in Arecibo, Las Cuevas de Camuy (caves created by the world’s third largest underground river), and the spectacular phosphorescent bay at La Parguera. On- and off-campus activities include salsa dancing, films, and DVDs, hikes to explore the indigenous Taino Indians’ petroglyphs with hand carved drawings in stone, fishing in the Sabanera lakes, and shopping trips to local shops. The Program uses the excellent sports facilities of the Sabanera community, as well as the championship golf courses and water sports facilities of the Dorado Beach resort. The afternoon sports program offers a wide range of recreational sports, including basketball, tennis, golf, soccer, swimming, fitness, kayaking, and sailing. Students may also enroll in the AC Milan Soccer Camp, which offers intensive training for competitive players under the supervision of highly-qualified coaches. 08:30 - 10:00 Activities, games, films, etc. *This Monday to Friday schedule illustrates a typical class day. 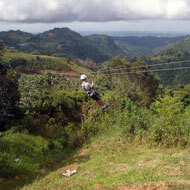 Saturdays are normally full day excursions to various locations on the Island. Sundays are free days for special optional activities. such as going to the beach, shopping trips, and cultural events. The schedule is subject to change, depending on the interests of the students and the needs of the Program. Conversational Spanish through full immersion and draws on the location of Puerto Rico as a living language laboratory. Daily Spanish classes are mixed with activity periods in art and music as well as Language in Life classes off campus, where students use Spanish in active situations with native speakers. Students are placed at the appropriate level of study based on their previous experience, level of maturity, and by taking a placement exam, which is administered at the beginning of the program. All TDSSP courses follow the traditional syllabi of independent American schools. The work is appropriately challenging and developing fluency is the emphasis. More comprehensive course descriptions and syllabi are available upon request and are sent home with the official grade comment at the end of the Program. This information assists the students in being placed at the appropriate Spanish level when they return to their home schools. Spanish I is designed for the student with little or no knowledge of the Spanish language. Spanish is the main language of instruction and communication in the classroom. All four language skills (reading, writing, listening, and speaking) are developed simultaneously, although the focus is on conversational Spanish. Students learn vocabulary associated with school, family, and pastimes. Basic grammatical concepts, regular/irregular verb conjugations, and basic tenses (present tense to simple future) are presented. Video programs, films, texts, and frequent excursions support cultural discovery and understanding. Spanish II introduces students to more complex structures and grammar and reinforces beginner level skills. It is designed for the student who has had at least one year or more of Spanish. All language skills are developed, but the emphasis is on spoken Spanish, and students are asked to communicate in Spanish at all times. Topics covered throughout the course include sports, travel, health, shopping, hobbies, and daily activities. Cultural awareness is enhanced through the study of geography, history, and daily customs of the Hispanic world, as well as through the frequent excursions. Spanish III is for students who already have a firm foundation in Spanish and who are ready to expand their language skills through in-depth study and practice with more complex grammatical structures, acquisition of more extensive vocabulary, and developing greater fluency through constant use of Spanish during classroom discussions on specific themes, and by studying the culture of the host country. The objective of the course is to enable the student to engage in, and to understand, a conversation in Spanish with a high level of comprehension. Spanish IV/V is designed for the more experienced student who is approaching fluency. This course aims to complete the acquisition of listening, speaking, reading, and writing skills through conversation, oral drills, essay writing, and comprehension exercises. More complex grammatical concepts are also reviewed and refined. The course provides an introduction to Spanish literature, which strengthens linguistic and cultural knowledge by studying Spanish literary texts and by participating in-depth class discussions. Frequent Langage in Life activities encourages students to use Spanish with locals in everyday situations, both on and off campus. Such activities include visiting a market, ordering typical culinary specialties, engaging in community service projects, visiting museums, and working with local artists or artisans. 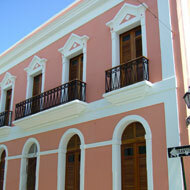 Classes in art, music, and dance, bring to life the rich artistic heritage and folklore of Puerto Rico.